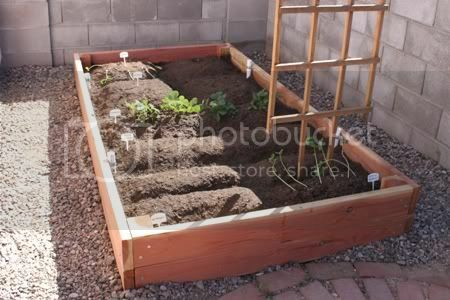 This year I've decided to attempt a vegetable garden for the first time. We have a gopher problem so an in-ground garden was out of the question - I'm not going to spend months babying my veggies only to have a gopher get to them first! I built this 95% by myself (my husband had to help with some of the heavy lifting) so I'm pretty proud of it. The frame is redwood. You can't see it, but before filling it with dirt we stapled hardware cloth (like chicken wire but with smaller holes) to the bottom so the gophers couldn't get in. The instructions I used were from Sunset.com. They were perfect because the size, 4 feet by 8 feet, meant it fit very nicely in the space I had. The only problem I had with the instructions were that they told me to buy 1 inch galvanized tube straps to attach the 1 inch PVC to the sides of the bed. However, I discovered that when I tried to use the 1 inch tube straps they were not big enough to go around the PVC and reach the sides of the bed, so I had to go back and use 1-1/4 inch tube straps instead. I'm spouting seeds inside and then transferring them outside. So far I've planted squash, green beans, and strawberries (those were bought already grown). I'll probably post some updates as things (hopefully) grow. Carne guisada is one of my favorite Tex-Mex dishes. It's basically beef in a gravy and is usually served with flour tortillas. Now that I live in Arizona I can't find carne guisada in restaurants so I have to make it myself. I tried to use a pre-made spice mix but it always ended up too salty, so I've come up with my own recipe. As it is, it's pretty mild so if you like things a little spicier feel free to substitute hotter chiles or add more chili powder. Dump beef and veggies into the crock pot. Mix spices and flour in 1 cup of water until mostly dissolved, then pour the mixture into the crock pot. Add more water until the meat is nearly covered. Put the lid on the crock pot and turn it on. Cook on high for 6 hours or low for 8 to 10 hours. Gravy will thicken as it cools, but if it is too thin you can a little more flour.